PennsylvAsia: Chinese American Student Association's annual Night Market, February 1 at Pitt. 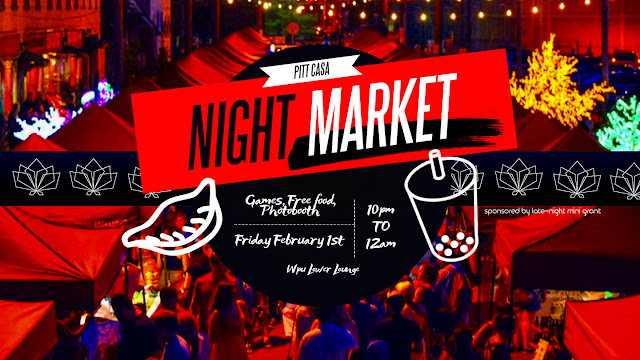 Chinese American Student Association's annual Night Market, February 1 at Pitt. The University of Pittsburgh's Chinese American Student Association is holding its annual Night Market on February 1. It's that time of year again, because CASA is proud to once again bring you our annual Night Market! Come to the WPU Lower Lounge on Friday, Feb 1st at 10pm to enjoy a night of fun activities, free food, and BUBBLE TEA from Chick'n Bubbly! It runs from 10:00 pm to midnight in the William Pitt Union (map).